Gallipolis City Commission is made of five elected members and three appointed employees, the city manager, the dual role city clerk and auditor and the city solicitor. 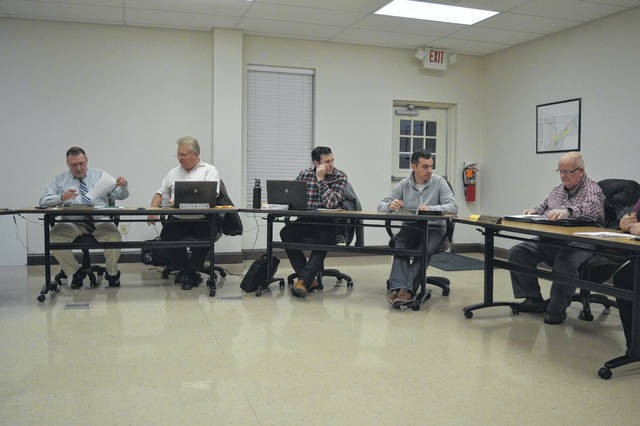 GALLIPOLIS — Two spots are open this year on the Gallipolis City Commission, the legislative branch of the municipality of Gallipolis. A candidacy statement and nominating petition has to be filed by Feb. 21 before a potential primary, which would be May 7. Petitions must have five signatures of individuals with the ability to vote within Gallipolis. “Your nominating petition must be signed by five qualified electors of the City of Gallipolis, Ohio, in ink, in front of the circulator who will then complete the bottom half of such petition. The candidate cannot circulate the nominating petition,” reads paperwork supplied by the city’s legal counsel. Paperwork must be returned to the Gallia Board of Elections in the Gallia Courthouse with a copy to the Gallipolis City Auditor Annette Landers by Feb. 21. Paperwork and information can be found at the Gallipolis Municipal Building at 333 Third Avenue. Commissioners are responsible for legislating the laws of the municipality, receive no salary for the position and serve four-year terms.